Studies: Degree in Translation and Interpreting English. I worked for several years as a Spanish teacher before I found TtMadrid and the world of TEFL. 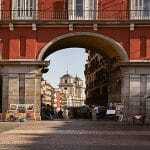 I was looking for a way to create long-term plans with my partner in Madrid and wanted to create a career out of my love of languages. 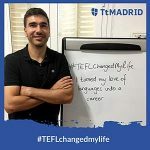 After my TEFL course I worked my way up to be the first non-native Director of Studies at TtMadrid and I haven’t looked back. My love of English and learning languages has created opportunities for me that I never dreamed possible. I have met people from all over the world and worked with an international team of people who love sharing their language and culture. The world of TEFL is special and unique, getting the chance to help so many people fulfill their dreams of living and work in another country is just amazing. What do you love most about Madrid? It’s the perfect city to live and work in! The cost of life is also very affordable and there is something for everyone and every taste. You can also travel to the nearby European countries when you get bored of the hundreds of places to visit in Spain itself! If you want to find out more about our TEFL courses click here!